Acute respiratory distress syndrome (ARDS) is a life-threatening lung condition that prevents enough oxygen from getting to the lungs and into the blood. 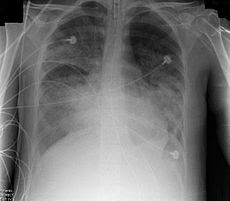 ARDS also known as respiratory distress syndrome (RDS) or adult respiratory distress syndrome is a serious reaction to various forms of injuries or acute infection to the lung. It is characterized by inflammation of the lung parenchyma leading to impaired gas exchange with concomitant systemic release of inflammatory mediators causing inflammation, hypoxemia and frequently resulting in multiple organ failure. Symptoms usually develop within 24 to 48 hours of the injury or illness. Often, people with ARDS are so sick they cannot complain of symptoms. There is no specific treatment for ARDS. A person with ARDS is treated in the intensive care unit at the hospital. Often a person with ARDS will need a machine's help to breathe (called mechanical ventilation) and oxygen therapy. Oxygen through a breathing tube. The tube is flexible and goes through your mouth or nose into your windpipe. The tube is connected to a ventilator, a machine that helps you breathe. Dengue Hemorrhagic Fever is a tropical disease that often leads to the death of children, adolescents and adults (Effendy, 1995). Patients complain of heat, headache, weakness, heartburn, nausea and decreased appetite. Medical history showed headache, muscle aches, the whole body aches, pain on swallowing, weakness, heat, nausea, and decreased appetite. There is no a specific illness. 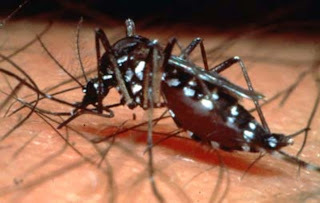 History of Dengue Hemorrhagic Fever disease in other family members is crucial, due to Dengue Hemorrhagic Fever disease is a disease that can be transmitted through mosquito bites aigepty aides. Usually less than clean environment, many puddles of water like tin cans, old tires, a water bird that rarely changed the water, the tub is rarely cleaned. Expected outcomes: The body temperature between 36-37 0C, muscle pain disappeared. Rational: find an increase in body temperature, facilitate intervention. Rational: reduce heat to heat transfer by conduction. Warm water is slowly control the heat removal without causing hypothermia or shivering. 3. Provide / encourage patients to drink plenty of 1500-2000 cc / day (as tolerated). Rationale: To replace fluids lost due to evaporation. 4. Instruct patient to wear clothes that are thin and easy to absorb sweat. Rationale: To provide a sense of comfort and wear thin easily absorbs sweat and does not stimulate an increase in body temperature. 5. Observation intake and output, vital signs (temperature, pulse, blood pressure) once every 3 hours or as indicated. Rationale: Early Detect hydrated and knowing fluid and electrolyte balance in the body. Vital Signs is a reference to determine the patient's general condition. 6. Collaboration: intravenous fluid and drug delivery according to the program. Rationale: Proper hydration is very important for patients with a high body temperature. Particular drug to lower a patient's body heat. 2. Risk for fluid volume deficit related to intravascular fluid into the extravascular migration. Expected outcomes: Input and output balanced, vital sign within normal limits, no sign of pre-shock. 1. Monitor vital sign every 3 hours / as indicated. Rationale: Vital sign helps identify fluctuations in intravascular fluid. 2. Observation of capillary refill. Rational: Indications adequacy of peripheral circulation. Rationale: Decreased urine output with increased density concentrated suspected dehydration. Rational: It can increase the amount of body fluid, to prevent hipovolemic shock. 3. Risk for Shock Hypovolemic related to excessive bleeding, intravascular fluid into the extravascular migration. Goal: Not happening hypovolemic shock. Expected outcomes: Vital signs within normal limits. Rationale: To monitor the condition of the patient during treatment, especially when paused bleeding. Nurses immediately know the signs of pre-shock / shock. Rationale: Nurses need to continue to observe the vital sign to ensure it does not happen pre-shock / shock. Rationale: By involving the patient and family the signs of bleeding can be quickly identified and appropriate action is fast and can be immediately given. Rationale: Intravenous fluids needed to overcome a severe loss of body fluids. Rationale: To determine the level of blood vessel leakage experienced by patients and to take further action reference. 4. Risk for imbalanced Nutrition, Less Than Body Requirements related to inadequate nutritional intake due to nausea and decreased appetite. Goal: No disruption nutritional needs. Expected outcomes: There are no signs of malnutrition, indicating a balanced weight. Rationale: Identify deficiencies, suspect the possibility of intervention. Rational: Supervise caloric intake / lack of quality food consumption. Rational: Supervise weight loss / oversee the effectiveness of interventions. Rational: little food can reduce vulnerabilities and increase input also prevent gastric distention. 5. Give and oral hygiene aids. 6. Avoid foods that stimulate and gassy. Rationale: Reducing distention and gastric irritation.